This How To will utilize Symantec’s Protection Engine, but any other vendor that support ICAP will work just as well. The Anti Virus Engine can protect you against malicious websites and infected file downloads, it does not protect the local clients. Therefore it is always a good idea to install a client based solution as well to protect against other forms of infection such as through emails or usb stick. For this example we have used Symantecs Protection Engine. The installation is straight forward, please refer to Symantecs documentation for full installation and configuration instructions. We installed the Engine for Web Proxy purpose and enabled ICAP with its default settings. Now connect the server that the engine is installed on to OPNsense trough either a switch or a direct cable connection. 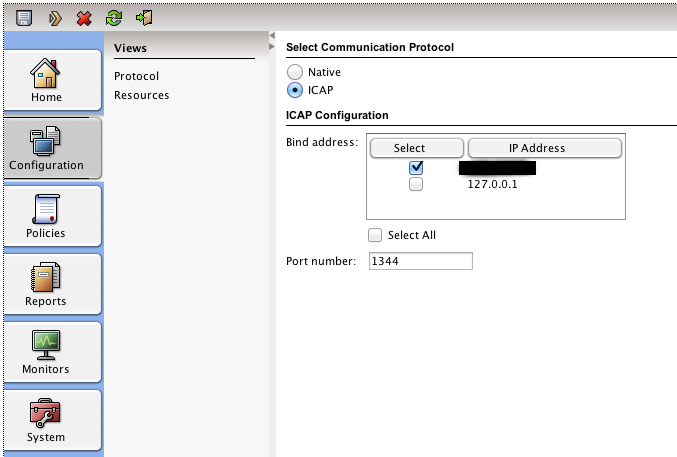 Preferable use a separate network for this traffic to make sure the unencrypted ICAP traffic can’t be tapped. ICAP traffic is not encrypted, meaning you have to make sure the traffic is not visible to anyone else. When using transparent HTTPS mode it is best to configure a separate interface for ICAP traffic and connect the Server (Engine) directly with a crosslink cable. Alternatively one may use a VLAN for this purpose. First test the HTTP protocol version. If that works, test the HTTP version if you have also configured the transparent SSL proxy mode. local administrator for further information.